When it comes to timber mouldings and skirting boards, it is important to understand the different properties of various timber choices in the market. Doing so will result in long-term gains for your project. Medium density fibreboard or MDF is an engineered composite of sawdust, wood shavings, small wood chips and resin, compressed together to form lengths suitable for manufacturing into skirting boards, architraves and other timber mouldings. Finger jointed pine is a solid pine timber where the board is created using small, individual pieces joined together with glue and small interlocking ‘fingers’ to create a neat zig zag effect at the join site. All knots are eliminated in this process. MDF’s high face strength helps it stand up to surface damage. The smooth surface finish gives it a flawless look once sanded and painted. MDF is also cheaper. Finger jointed pine is less expensive than solid wood, but has all the benefits and characteristics of ‘real’ timber. It is less prone to twisting and warping; is light and rigid enough for one person to install; holds nails well; has greater longevity than MDF with significantly reduced requirement for replacement; is a natural wood product with a visible grain; is easier to install, being less abrasive on cutters and tools and therefore requiring less maintenance to keep blades and cutters sharp; and does not split when fixing through edge grain like MDF. MDF’s high strength can make it difficult to nail by hand. Since its edge strength is lower, outer mitre cuts must be handled with care during and after installation as the board can split. Being manmade with no natural timber grain, it can be difficult for nails to ‘grab’ and screws can easily strip, making it easier to remove from a wall surface. For best installation results, it is important to use an MDF adhesive. MDF boards are heavy and ‘floppy’, making it difficult for a single person to handle large lengths during installation. Long lengths are more prone to breaking than finger-jointed pieces due to the larger ‘flex’ in the material. MDF can absorb moisture over time, leading to swelling, warping and bubbling. MDF mouldings have to be pre-primed (including the back face) and should never be used in wet areas or applications where they may be exposed to moisture through floor mopping or steam cleaning. It is also not recommended for use in tropical and high humidity climates for this reason. MDF cannot be stained and, therefore, cannot achieve a natural timber look. Although MDF is stronger, it is more difficult to repair if dents or marks are made on the material. Finger jointed pine is slightly more expensive than MDF. As it is a natural timber material, it is softer than MDF and can be more susceptible to marks. 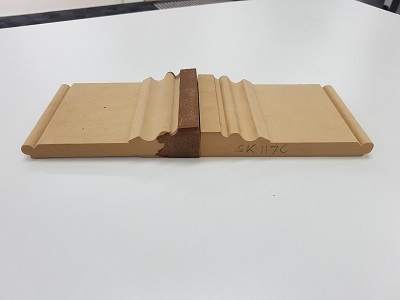 Intrim ran a test to show the effect of moisture on MDF. The image above shows swelling to the profile when the base of the moisture-resistant MDF moulding is exposed to water for just 24 hours. The two samples in the image originally had the same profile in the same size. When MDF absorbs water in a home over time, it also affects the paint and causes bubbling. Without a doubt, finger-jointed pine is a superior material for timber moulding profiles. However, for budget reasons, if you still choose MDF, Intrim recommends having it factory pre-primed to seal the entire surface and give it the best protection possible from moisture absorption. In wet areas, or areas with hard floors (which would need to be mopped or steamed to clean), we only recommend the use of finger jointed pine skirting boards. Though you may not have an immediate saving on your initial purchase of finger jointed pine mouldings, their ease of installation, longevity and durability will reduce your risk of early replacement and save you money in the long run.